We look at the week in politics, including President Trump's response to the mosque shootings in New Zealand. President Trump responded to the mosque shootings in New Zealand on Friday by saying it was a terrible thing. But again, contradicting national security experts, he also minimized the threat that white nationalism poses worldwide. PRESIDENT DONALD TRUMP: I think it's a small group of people that have very, very serious problems. I guess if you look at what happened in New Zealand, perhaps that's the case. I don't know enough about it yet. GARCIA-NAVARRO: The president spoke as he vetoed his first bill, legislation to overturn his declaration of a national emergency in order to fund the border wall. Joining us now to talk about this and the rest of the week in politics is NPR national political correspondent Mara Liasson. GARCIA-NAVARRO: So, as we mentioned, the president made his comments on the Christchurch shooting during a very well-orchestrated Oval Office veto signing ceremony, this on the same day as the tragedy. What about that timing? LIASSON: You know, whether or not the president should have held his veto ceremony on the same day that the world was reacting to this massacre - what happened was that his message got all tangled up with some of the language that this alleged shooter had used. You know, you just played what he said, saying this is an isolated incident. He's not worried about white nationalism on the rise. But just a few moments before that, he had used - talked about immigration as an invasion. He said, quote, people hate the word invasion, but that's what it is. It's an invasion of drugs and criminals and people. He went on to say, you have killers coming in and murderers coming in - very similar to the language about non-white immigration as an invasion that the alleged shooter used. And this is a common theme of the president's - that immigrants are coming to kill us. GARCIA-NAVARRO: And, of course, we have to note here that most of the recent acts of terror in this country - some 98 percent, according to the Anti-Defamation League - have not been committed by immigrants or Muslims but by far right groups - many white nationalists. LIASSON: That's right. You had church shooting in Charleston, S.C. in 2015. You had the Charleston Unite the Right March. LIASSON: I'm sorry - Charlottesville, where a woman was killed. You also had the arrest of a Coast Guard lieutenant on gun and drug charges where he had a hit list of prominent Democrats and media figures. He was a self-proclaimed white supremacist and an alleged pipe bomber. So you've had a lot of these events, and they are - make up a much larger part of planned terrorist attacks or actual terrorist attacks than any other type. GARCIA-NAVARRO: Yeah. And bizarrely, we had White House adviser Kellyanne Conway saying the man charged in the mosque shootings was wrong to call President Trump a symbol of renewed white identity, as he did in his manifesto, and that the man was actually an eco-terrorist, said Kellyanne Conway, which is false. LIASSON: He actually called himself an eco-fascist. And he did say in his written statement - he said were or are you a supporter of Donald Trump as a symbol of renewed white identity and common purpose? Sure. And, you know, this has sparked a renewed debate about whether or not Trump's rhetoric indirectly encourages these kinds of white nationalist terrorist events. It's something that the president and the White House rejects. But it reminded everyone of his comments after Charlottesville, where he said there were good people on both sides, the tweets during the 2016 campaign bearing a picture of Hillary Clinton and a Star of David. So this has renewed a debate about the president's language. GARCIA-NAVARRO: That's NPR's Mara Liasson. David Gergen in Eyewitness to Power: The Essence Of Leadership Nixon To Clinton (2000) predicts that “It is just possible that we are living at the dawn of a new golden age. But progress will be neither sure nor inevitable. Much of it will rest upon the quality of our leaders, starting with America's president. The twentieth century began in an air of triumphalism. Experts looked ahead and saw an unparalleled opportunity for human advancement. But over the next fifty years, a new dark age descended, as men plunged into the bloodiest wars in history and Depression struck. Just after World War I, there were twenty-nine democracies; by the middle of World War II, only twelve. Trade among nations withered and not until the 1970s reached the same levels of intensity as at the beginning of the century. What went wrong? Bad leadership was a large part of the answer. At a moment of crisis the quality of a nation's leader can be decisive. The presidency remains the center of our democracy. The man who occupies that office—and, one day soon, the woman—will always be the single person who can engage the dreams and mobilize the energies of the country behind large, sustained drives. Generally, we are a people who like to get on with our lives without paying much attention to Washington. But there are times when we have to act together. Dwight Eisenhower like to think of us as a people who are at our best joining up with a wagon train heading west and working together to get over the mountains. Once in California people go their own ways. The American president is always the one who will organize the wagon train. If we are to realize a new golden age, it will be vital that our next presidents exercise a wisdom and will that help us to move steadily forward. They must work to keep the world on a stable, upward course, even as they fight off bouts of isolationism at home and rising resentment of American power overseas. They must manage a dynamic economy with a light hand, even as they seek to ensure that people left behind have more equal opportunities in life. The "Youth Climate Strike." It’s their future, and their planet. We talk to young students about their urgent call to adults to take action on climate change now. Feliquan Charlemagne, 17-year-old high school student and national creative director of Youth Climate Strike USA. Associated Press: "Make love, not CO2: Students worldwide demand climate action" — "From the South Pacific to the edge of the Arctic Circle, students mobilized by word of mouth and social media are skipping class to protest what they see as the failures by their governments to take tough action against global warming. "Friday’s rallies were one of the biggest international climate change actions yet, involving hundreds of thousands of students in more than 100 countries around the globe. "The coordinated 'school strikes' were inspired by 16-year-old Swedish activist Greta Thunberg, who began holding solitary demonstrations outside the Swedish parliament last year." Time: "'It Will Be Too Late for My Generation.' Meet the Young People Orga..." — "Thousands of schoolchildren across the U.S. will be protesting on Friday, uniting with young people around the globe in a goal they believe is critical to their collective future: pressuring world leaders into acting on climate change, particularly to cut carbon emissions over the next decade in order to reduce the extent of global warming. "Young people in nearly 100 countries, including China, Uganda, New Zealand and Chile, are striking in solidarity on the same day, according to Villasenor. In the U.S., the movement was primarily organized by three schoolkids — Villasenor of New York, Haven Coleman of Colorado and Isra Hirsi of Minnesota (who also happens to be the daughter of freshman member of Congress Illan Omar) — with an assist from hundreds of teens and tweens on the state and local level." 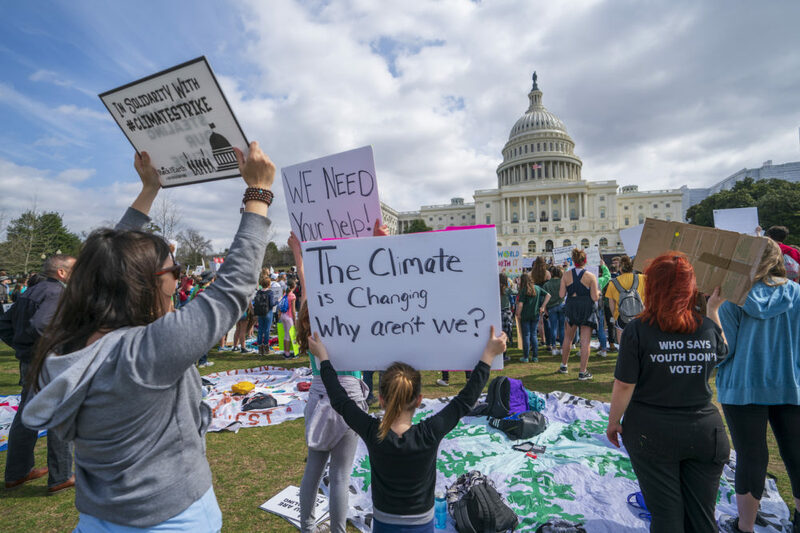 Scientific American: "Opinion: Why Scientists Should Support the Youth Climate Strike" — "They are striking because our world leaders have yet to acknowledge, prioritize, or properly address the climate crisis. They are striking because marginalized communities across the world—especially communities of color, disabled communities, and low-income communities— are already disproportionately impacted by climate change. They are striking because their futures are at stake. "Their actions are backed by the best available science which shows that we need to rapidly decarbonize our economy and deeply transform society in order to avoid the most catastrophic effects of climate change. They are treating the issue of climate change with the urgency that science and justice demand. "We ourselves, as a movement of science advocates, have taken to the streets in our millions over the last two years to fight for our communities and our planet. We offer everyone else who does the same our unreserved support and solidarity." This program aired on March 18, 2019. Audio will be available soon. Presidents must be good stewards not only of the United States, but also of earth itself. Increasingly, they must make difficult decisions about technology and science that will transform the way we live. Our presidents must know how to lead—that they bring to bear the qualities of personal character, idealism, political skill, and organizational strength that give power to their office. Leaders, some believe, are born, not made. It certainly appears that many of the best of the past century—Churchill, the Roosevelts, Gandhi, Mandela, Golda Meir, Martin Luther King, Jr.--had leadership in their bones. But each of them gained enormously by studying and drawing upon the experiences of others. Training and understanding of the past have been indispensable to the preparation of most leaders. David Gergen's 2000 prediction from Eyewitness to Power: Today's politics is ripe for a president to come into office and offer “a new paradigm.” There may not be an old orthodoxy to knock down; no single regime of ideas is now dominant. But the winds of change are blowing so hard that voters are eager to find a leader who will set forth a clear, steady path into the future. The next president who does that successfully will also be the next to have a living legacy. The only war the US won against a worthy opponent is The War in the Pacific in 1945. Prior and after it has always been imperialistic wars. Now Trump has chosen to fight another imperial war in Venezuela--because it has no WMD to fight back. If the people of Venezuela want regime change, it is up to them without the aid of the US Marines. Its all about oil baby.